We know that there is a demand for pet-friendly apartments, but are renters actually searching for apartments this way in Google? Emphatically, the answer is yes. 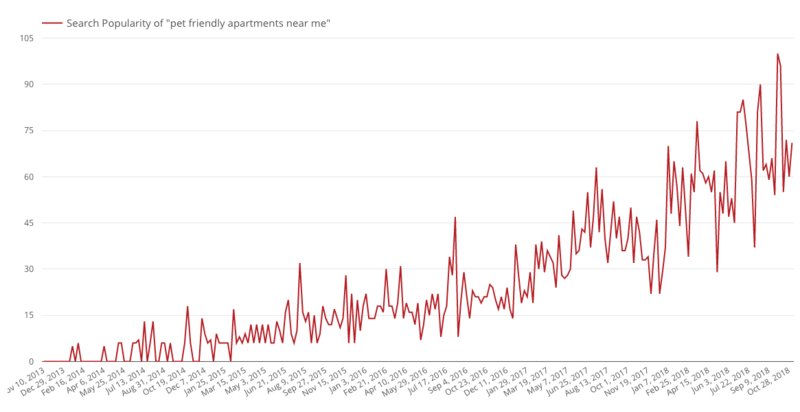 Over the last five years searches for “pet-friendly apartments near me” has grown significantly in popularity. This Google Trends report nicely illustrates this growth. Our Google Trends research also found that popularity for this search term was the highest among the following regions. Popularity for pet-friendly apartment searches was the greatest among metros in the Midwest, New England and Los Angeles. If you happen to be marketing a community in one of these areas, this is a rental segment you don’t want to miss out on! How can communities capitalize on the rising demand for pet-friendly apartments in their search strategy? Create pet-friendly ad sets. Our paid search experts include a robust set of pet-friendly keywords within a pet-friendly community’s campaign. They also create a set of paid search ads with pet-friendly headlines so that prospects searching for pet-friendly apartments are presented with a relevant ad. Ensuring the ad headline includes pet-friendly also increases the chances that Google will favor the ad in pet-friendly searches, which leads to a higher search ranking. 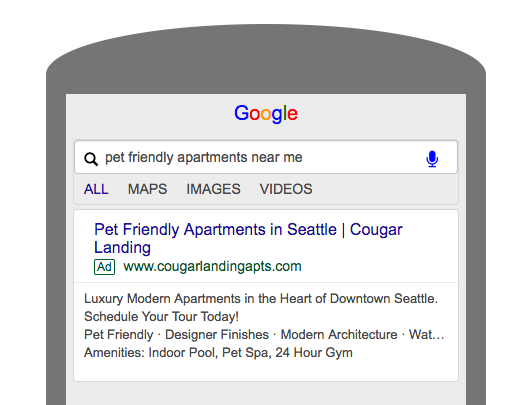 Ad Extensions are another way to show off your pet-friendly status in search ads. Our team typically adds “pet-friendly” in callout extensions and lists pet amenities (ex: Pet Spa) in structured snippet extensions (referencing the sample ad above, the callout extensions are under the description copy and the structured snippets are in the line below the callout extensions). Ad extensions that incorporate pet-friendly features are set to run across all of your ads, so if there are searchers who have pets but are searching for communities using generic search terms, i.e. “apartments near me”, they still have the potential to see your pet-friendly callout and structured snippet extensions. To get a better understanding of how ad extensions work and which ones are right for apartment communities, check out this blog post. 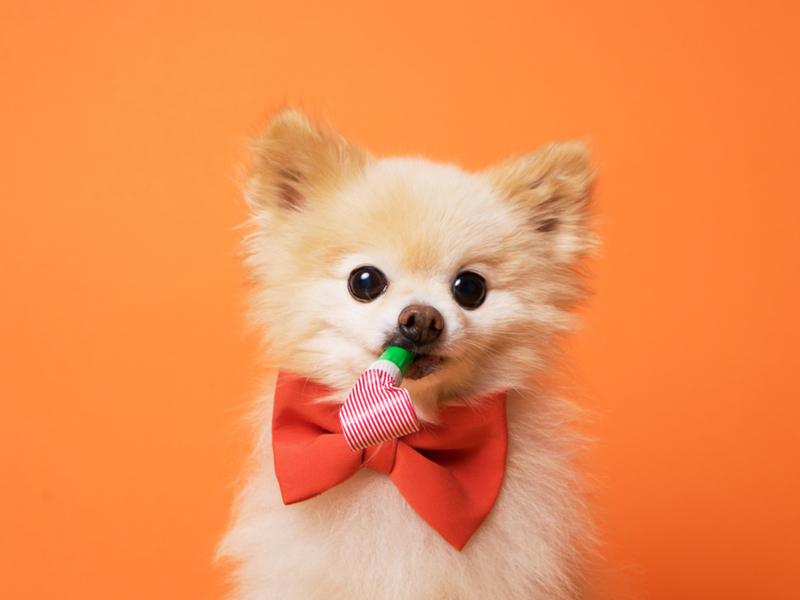 Incorporate your pet amenities in your social campaigns. Carousel ads on Facebook and Instagram are a great way to present pet-friendly services and features alongside your other apartment amenities. You can highlight the amenity or service using a headline and an image. If pet owners make up a significant portion of your target market, you may want to use targeting options in Facebook that present your ad in front of pet owners in the rental market within the geographic radius surrounding your community. These two examples below showcase how two different pet-friendly communities used pet amenity carousel cards within their Facebook and Instagram ads to better appeal to pet owners. Do you film video content to advertise your community? Have the pets in your apartment complex make a cameo appearance. You can use the footage you film as a part of an overall community video tour or break up the pet-friendly clips and use them on your website, organic social media or for short video ads on YouTube, Facebook or Instagram targeting pet owners. Need an idea of what to film? Try interviewing happy pet owners about why they like living in your community with their pet. Show them in action using your amenities or walking their dog. Make sure your pet policy and pet-friendly amenities are listed on your community’s website. On many apartment websites, finding the pet policy can be a trying task. 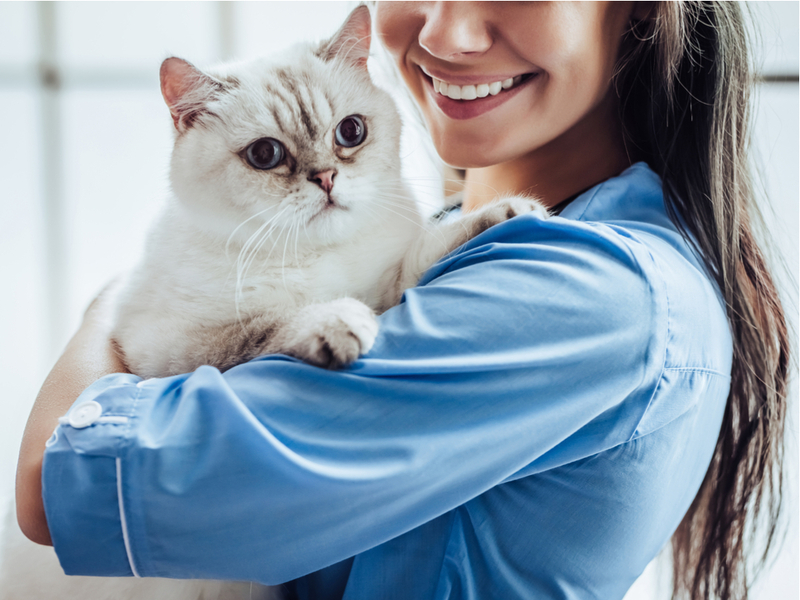 If a pet owner came to your community’s site through a pet-friendly search or social ad, they are going to be interested in reading your pet policy. Consider creating a landing page on your website that houses the information pet owners care about in one place. Include any pet deposits, pet rent, and pet restrictions in your pet policy. Bring this page to life using pictures of your pet-friendly amenities and testimonials from pet owners. This webpage can also serve as a relevant landing page for any pet owner specific marketing campaigns you might want to run in the future. Are you interested in targeting pet owners but don’t feel that your community is currently offering a competitive and compelling pet experience? Consider implementing some of these amenities to make life more convenient for pet owners. One of the things dog owners crave the most is more green space for their fur children. 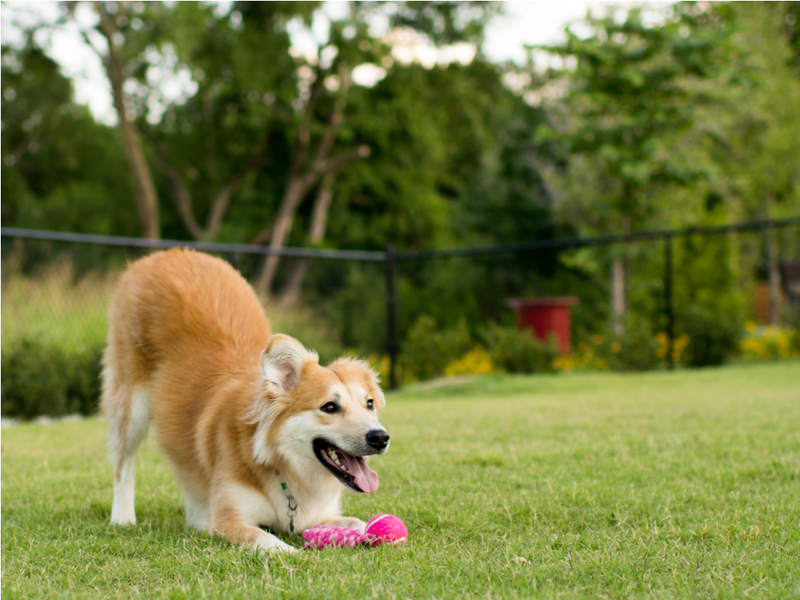 Most dog owners wish they had a yard to let their dogs run around and expel their energy. Dog parks and dog runs give residents a place to play with their dog, meet other pet owners and let their dogs socialize. Is your community cramped on outdoor space? Some communities are using indoor dog areas that are covered and lined with fake grass to replicate the dog park experience while providing pet owners with the added benefit of a weather protected area to walk their dog. Partner with dog walking, pet grooming, and pet sitting services to make your residents’ lives more convenient. A NMHC 2018 Consumer Housing Insights Survey found that convenience was one of the most important benefits a community can offer renters (92% of renters stated that convenience was an important factor for them). Communities can go as far as providing these services as built-in amenities, charge an additional monthly fee, or give residents a list of recommended pet walkers, vets and sitters upon move in. In any case, giving pet owners the resources to make their lives easier with needed pet services will help you attract and retain residents. Make it easy for pet owners to wash their pets with a pet washing station. This can be as simple as adding an outdoor pet bath or as involved as creating an entire indoor pet spa space. 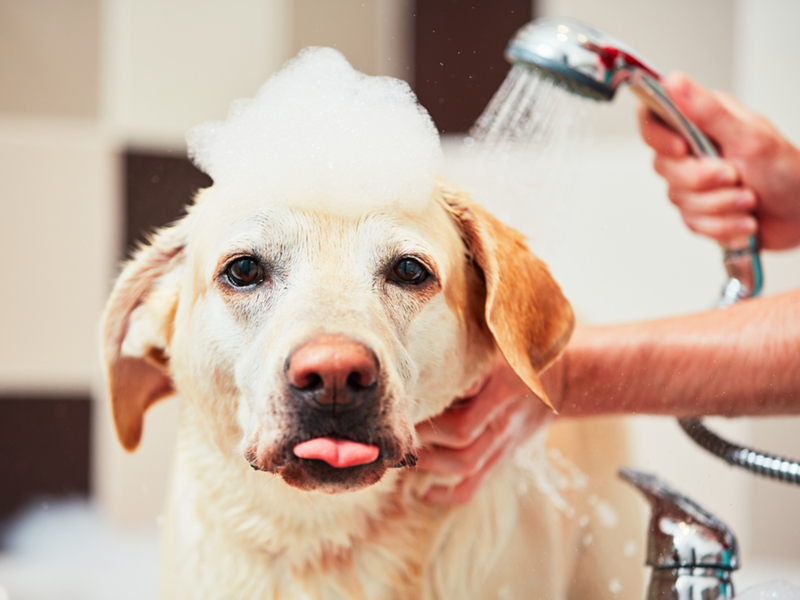 While this definitely can become a luxury amenity, even just an outdoor wash space can be helpful for pet owners looking to wash their pets off before they enter their unit and prevent pet hair from clogging their bathtub. Host resident pet events so that pet owners can get together and bond over their mutual love of their pets. Pet owners love to talk about their pets the same way parents love to talk about their children. 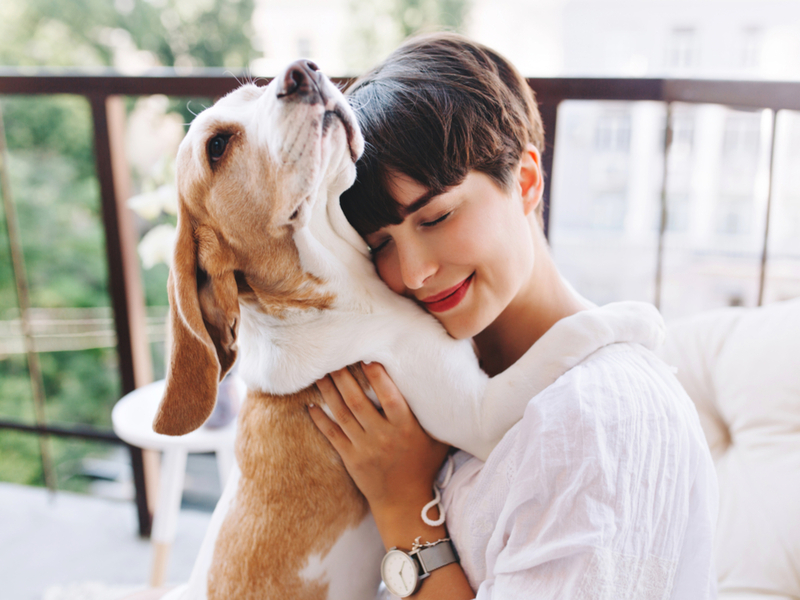 By hosting a pet event you create an environment where everyone at the event has something in common and increase the likelihood that residents will make friends, stay engaged with the community, and continue to renew their lease. This is a simple yet effective way to win over pet owners. 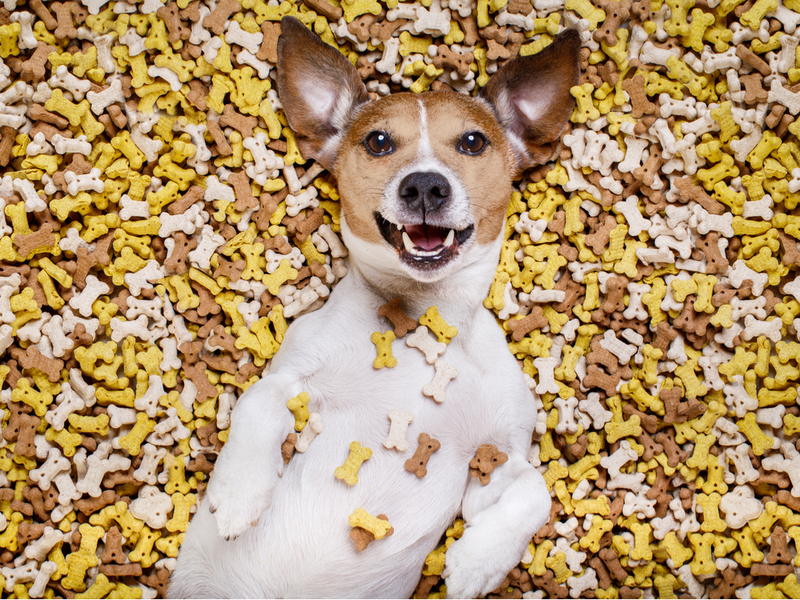 Keep pet treats at the front desk and use them as an opportunity to surprise and delight residents. If your community isn’t able to invest too heavily in pet amenities but want to add a meaningful touch to the pet renter experience, this is a great small step your community can take to show residents you care. Did you find these pet-friendly apartment marketing ideas helpful? Pass this post along to a colleague or consider sharing it on LinkedIn with the social sharing buttons located on this page. YouTube Performance Study: Selecting the Right Video Content for Your Apartment CommunityShould I use AMP to Improve My Google Ranking?